That’s the new release date for Drake’s highly anticipated Thank Me Later album, Drake said at his April 9 concert at Bryce Jordan Center in State College. His collaborator, Jay-Z, performed at BJC on Oct. 9, 2009. Initially, Thank Me Later was slated for release on February 14 but was pushed back to May 25. In 2009, the Canadian-based rapper/singer/actor bucked the trend in the music industry by releasing his classic So Far Gone mixtape. 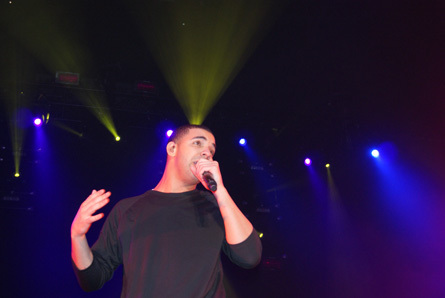 With its airtight production and diverse sound, Drake achieved overnight success with So Far Gone. This success led to a Grammy nod and two BET awards—all this before dropping an album. The Lil Wayne protégé became the No. 1 draft pick of Wayne’s Young Money Entertainment when he signed with the Cash Money Records imprint in June 2009.
great coverage as usual homie keep up the great work! Yea, Drake is helping hip-hop evolve. Thanks again w/ your help for the concert ticket. Nice article. Check out George Reefah – also out of Toronto. I think his style fits nicely with your taste.